In an elevated and modernized version of a classic design, these dangling earrings feature a pair of non-heated royal blue sapphires of over 20 carats in total - the precious stones are lined with alternating fancy intense pink and white diamonds. An extraordinary creation for its incredible size and unique color pairing. The pristine Colombian emeralds weighing over 17 carats each, sit comfortably cradled in the embrace of a loop strung together by 30 gorgeous, pear-shaped, D to F color diamonds of over 11 carats in total. Surrounded by pink pavé diamonds, these gorgeous pear-shaped fancy light pink diamond droplets of five carats dangle playfully beneath a matching radiant-cut diamond on top. The clean and simple design relies heavily on the impeccable artistry of our craftsmen. 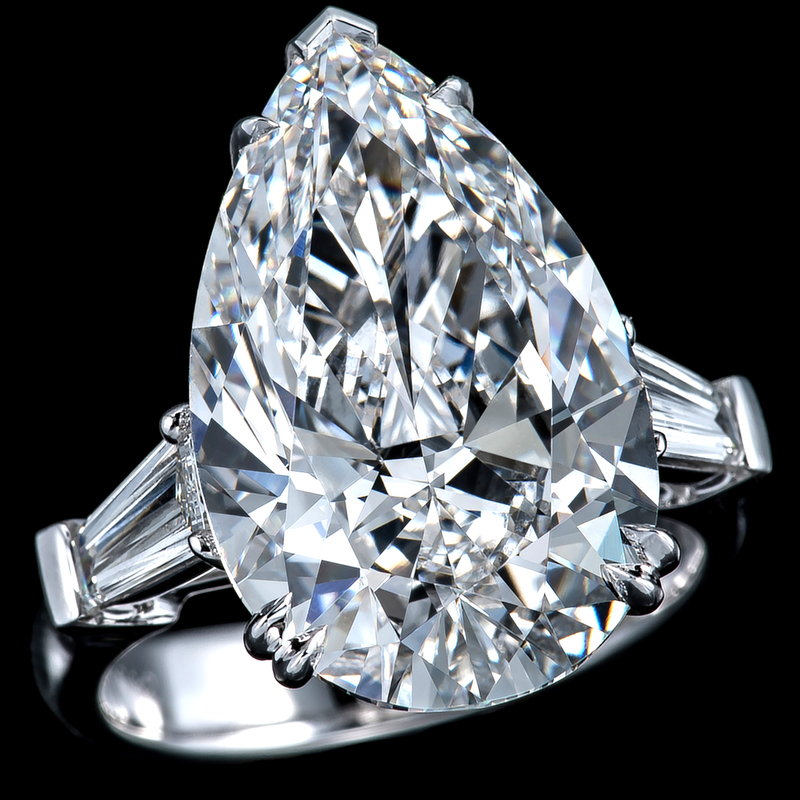 The four D color diamonds weigh over 14 carats and is perfectly cut in terms of size and shape for an immaculate match. Belonging in our Sunlight collection, this pair of dangling earrings manifests like the light of nature. 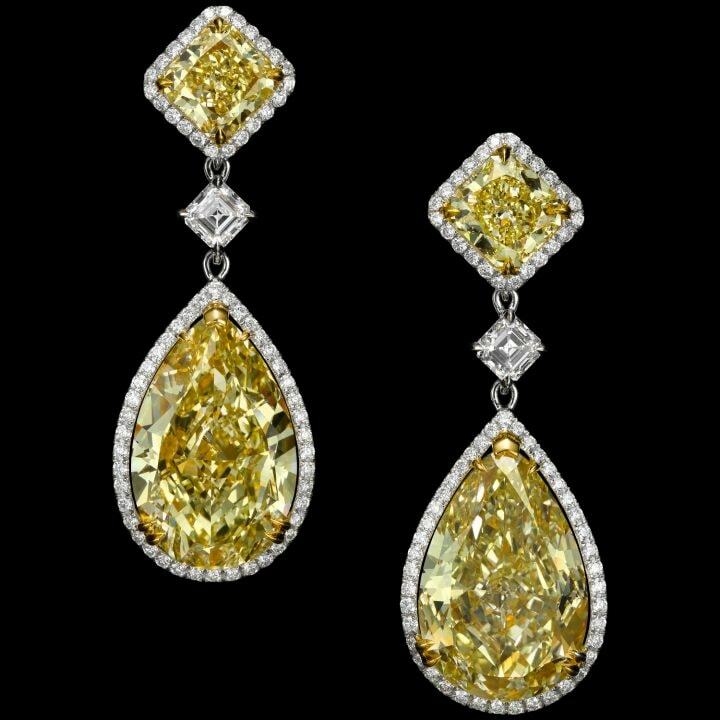 Two magnificent, precious drops of fancy yellow, pear-shaped diamonds weighing a total of over 32 carats beautifully hang beneath a matching radiant-cut yellow diamond with a pavé set diamond surround. 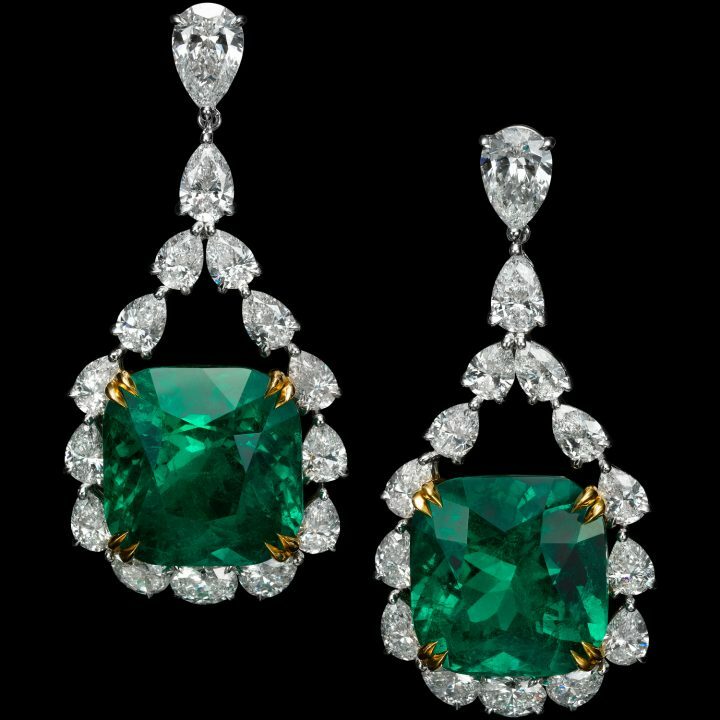 A unique contemporary design, this pair of earrings is the ultimate embodiment of extravagance and modern artistry. 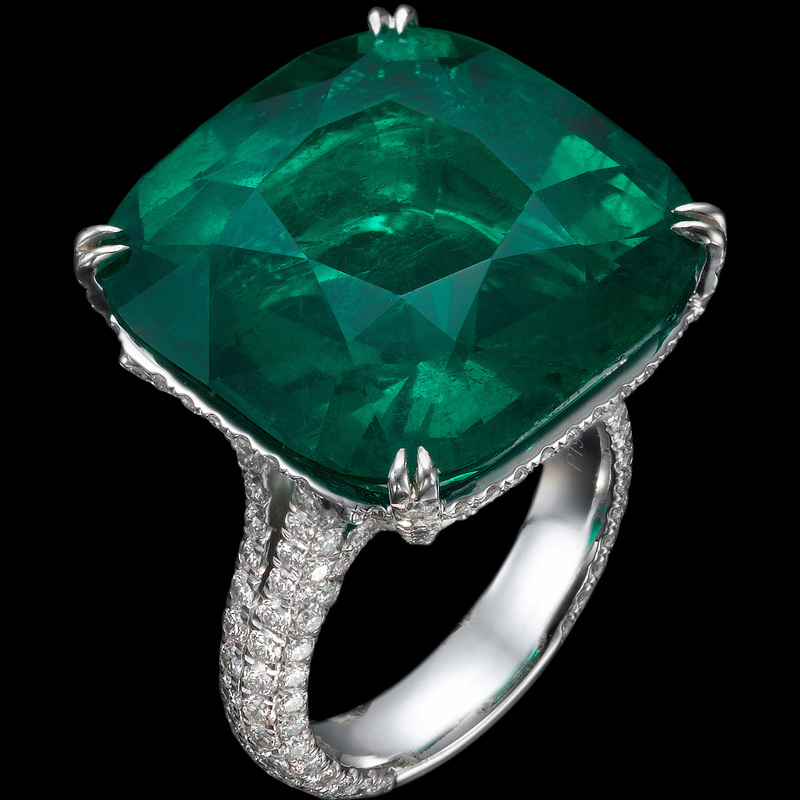 This creation features two four-carat, natural emeralds juxtaposed against an abstract cluster of mixed-cut white diamonds for a striking contrast in color and silhouette. 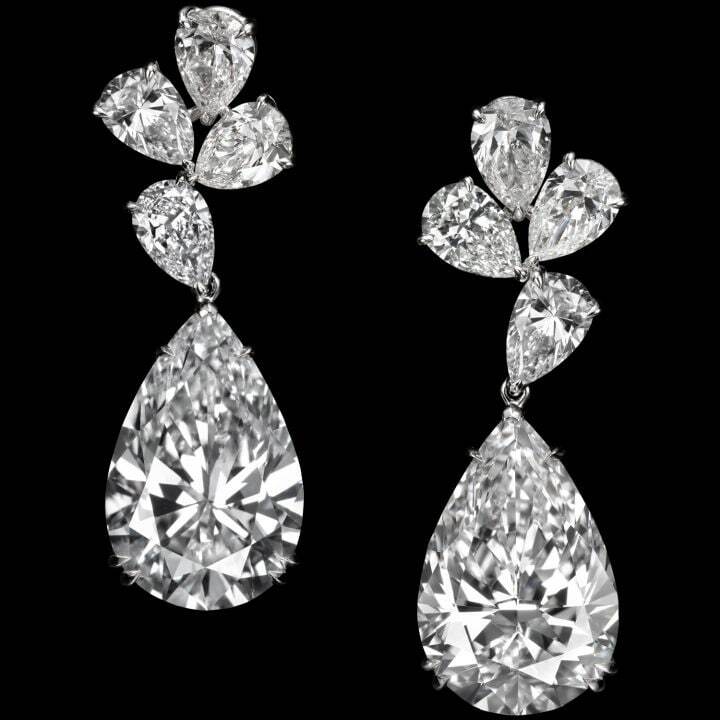 A true statement piece of jewelry, the earrings from the Majestic collection feature a perfect pair of prominent pear-cut diamonds weighing over 14 carats each. 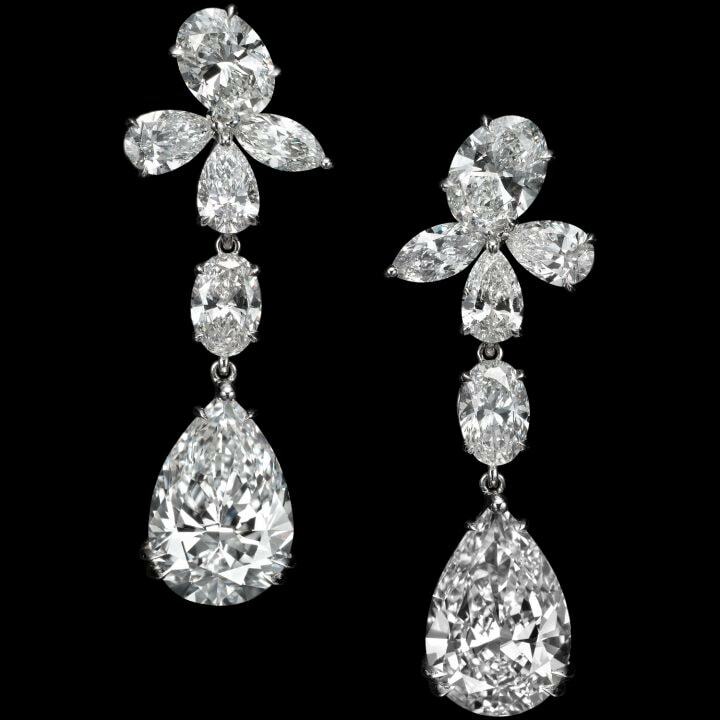 These beauties dangle from two gorgeous clusters of E to F color, pear-shaped diamonds, weighing over 36 carats in total. 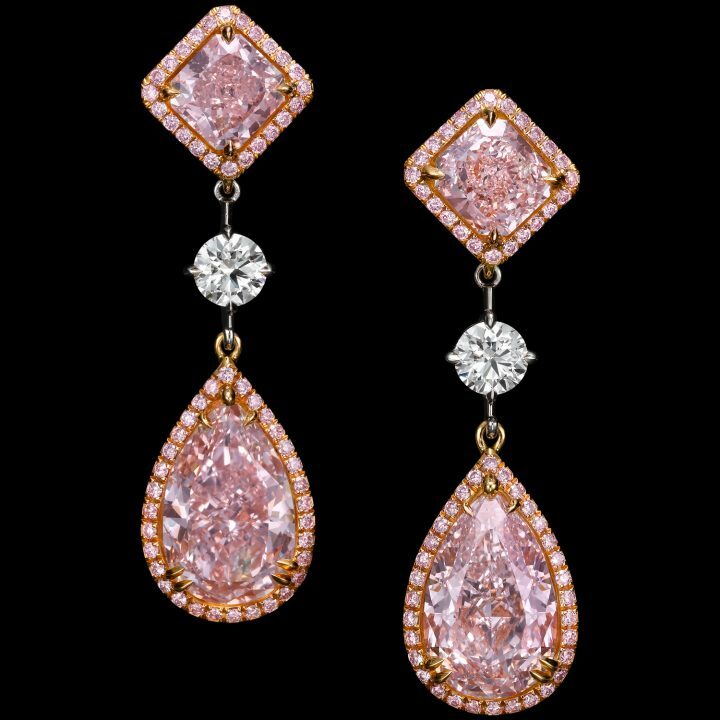 The motif of these extravagant drop earrings center around perfectly matched fancy intense pink diamonds of three carats each, surrounded by a pear-shaped diamond halo. The floral-inspired composition dangles under a cluster of diamonds, creating movement which best captures light. 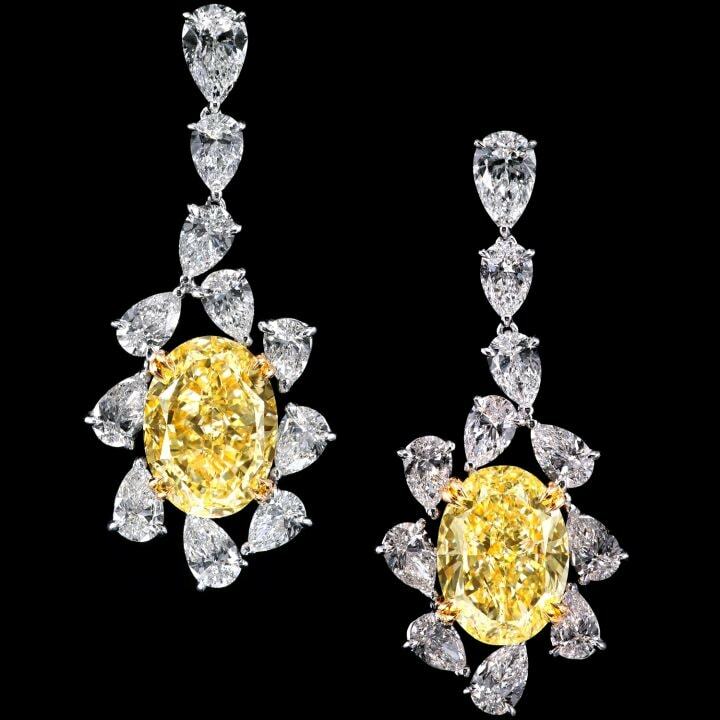 Cradled in a hanging loop composed of pear-shaped white diamonds of D to F color, sits a mesmerizing oval-cut fancy yellow diamond. Its simple yet unique design was engineered to maximize movement for the best reflection of light. 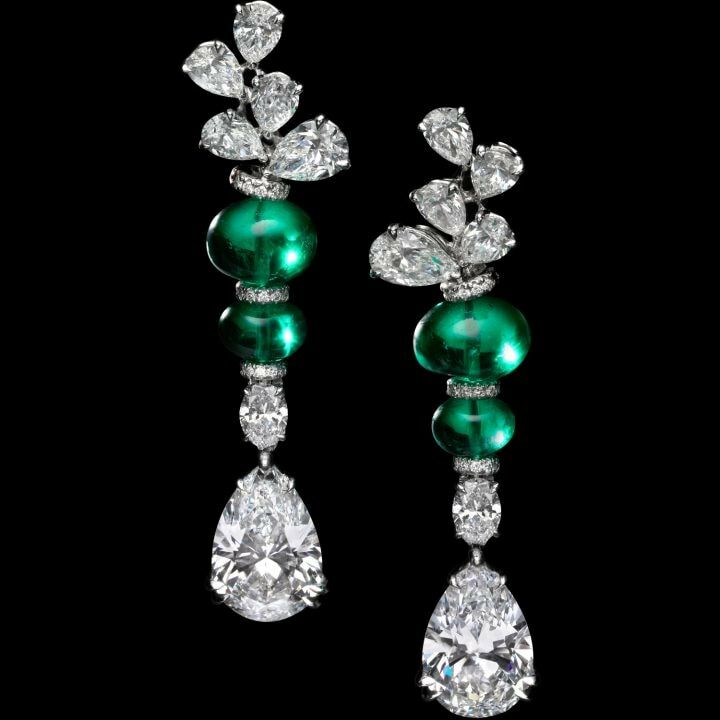 Influenced by the 1920s flapper era, these dangling beauties boast four non-oiled natural emerald beads and two D color internally flawless five-carat pear-shaped diamonds. The dangle drop design gracefully captures the dance of light. Designed to sway and capture movement, these retro-inspired chandelier earrings feature 60 dazzling D to F color diamonds weighing just under 30 carats. 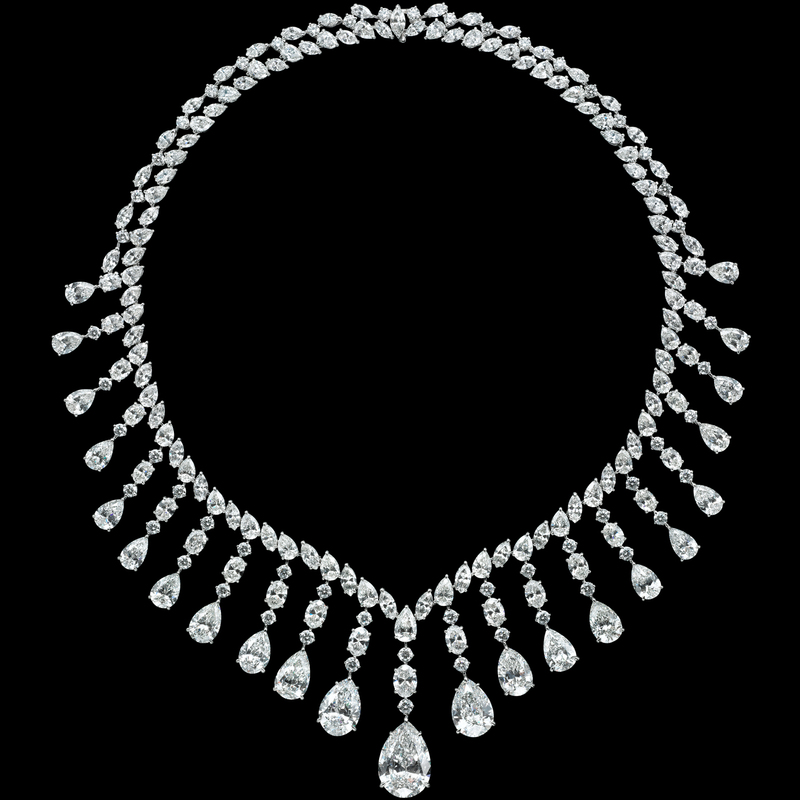 When in motion, the branches of hanging diamonds illuminate with refracted light creating a dazzling and dramatic effect. These stunning sunflower earrings belong to a collection which contains a magnificent matching necklace. 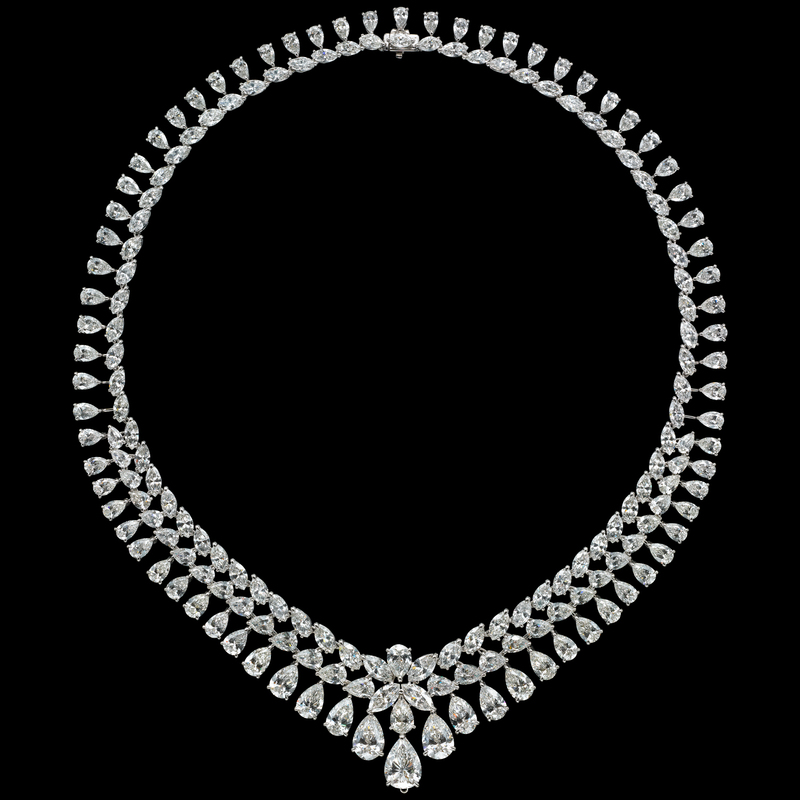 The diamonds in this piece weigh over 26 carats and showcase four scintillating radiant-cut, fancy yellow diamonds, mirroring the disc florets of the blossom. Six diamonds of varying sizes of D to F color are strung together to create this timeless pair of exquisite earrings. The stud and drop of the earring is illuminated with a pretty pavé trim of fancy intense pink diamonds to intensify the brightness of the white diamonds of over 11 carats.